Two MPs behind the Labour fundraising event where a copy of the Hutton report signed by Cherie Blair was auctioned have said they regret any offence. Chris Bryant and James Purnell said it was a private event and no money would now be accepted for sale of the report. 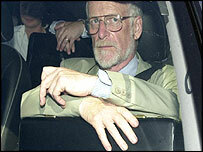 The Hutton Inquiry was convened after the death of government scientist Dr David Kelly, named as a source for a BBC story about the Iraq War. Dr Kelly's local Tory MP, Ed Vaizey, says the auction caused offence. Mr Vaizey made the claim after Tony Blair said he did not believe any offence was intended by auctioning the report into the weapons expert's death. The report raised £400 for Labour coffers when it was auctioned in Mayfair in London last week. In their statement, Mr Bryant and Mr Purnell said: "This was a private event. No-one intended to give offence, and if there is any offence we sincerely apologise. "We have not received any money for this item and we want to make it clear that we will not accept any." A Commons motion has already condemned the auction, which was attended by a number of government ministers, as "in appalling bad taste, arrogant and crassly insensitive" and for causing distress to the Kelly family. It called for Labour to say sorry "for such tasteless and offensive conduct and to donate the money raised to an appropriate charity". At prime minister's questions, Tory MP Robert Goodwill asked Mr Blair if it was right that copies of a report on an inquiry into a public servant's death should be "signed by celebrities" and "auctioned to raise funds for a political party". Mr Blair replied: "I do not believe that any offence to anyone was intended." However, minutes later, in a point of order, Mr Vaizey, who represents Wantage in Oxfordshire, told MPs: "When the prime minister said no offence was intended to be caused by the sale of that document, I can assure him that it was caused." Solicitor Peter Jacobsen told BBC News that Dr Kelly's family was not going to comment on the controversy over the auctioning of the report, or Mrs Blair's signing of it. He said the family viewed the affair as a matter outside their control. The prime minister's official spokesman said he would not get involved in the row, adding that "it was a party matter and nothing to do with us". Meanwhile Conservative MP Graham Stuart is urging Sir Alistair Graham, chairman of the committee on standards in public life, to investigate. But Sir Alistair said the complaint was entirely outside his remit as Mrs Blair was not a public office holder. Dr Kelly was found dead in July 2003 after being named as the possible source of a story on BBC Radio 4's Today programme claiming the government had "sexed up" the intelligence which formed the basis of its dossier on Iraq's weapons of mass destruction. Lord Hutton concluded in his report published in January 2004 that the 59-year-old Ministry of Defence weapons expert had killed himself by cutting his left wrist after taking co-proxamol painkillers. There was no evidence that any third party had been involved, he said.